Free Shipping Included! 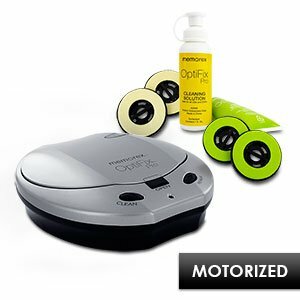 Memorex OptiFix Pro Motorized CD/DVD Scratch Repair Kit for CD/DVD Music, Movies, Game Discs by Memorex at Home Entertainment Centers Online. MPN: 08007. Hurry! Limited time offer. Offer valid only while supplies last. Bring your CDs, DVDs, and Games back to life Product Information Memorex's OptiFix Pro is the solution to your disc problems! Memorex's OptiFix Pro is the solution to your disc problems! The OptiFix Pro is an automated clean and repair process that will safely and effectively clean dust, dirt, oil and fingerprints, as well as repair scratches on your discs in less than 3 minutes. It is compatible with all discs, including CDs and DVDs, as well as XBOX, GameCube and PlayStation games. The system comes with an AC adapter, so no batteries are required. A practical, user-friendly design makes for an easy out-of-the-box experience: just plug-in, repair, clean, and your disc is good as new.